Audience: 15 – 25 females (I think this book could be used with co-ed groups, but lends itself more toward a female audience). This book would also be useful with parents of children with anxiety disorders. Summary: This book of poetry is written in a free verse, progressive story form and relates the life of Samantha Schultz (the author) from the end of high school through her college years when she began to experience severe anxiety attacks, and tells how she struggled to come to terms with her illness as it impacted her relationships, her life goals and her perception of herself. It is an honest and engaging look behind the eyes of mental illness that helps to dispel misconceptions about panic disorder and yet raises many other questions regarding how we interact with those who suffer. Literary elements at work in the story: This is a non-fiction, free verse book of poetry that is written in narrative form. The first person perspective is maintained throughout and her language is colloquial; flowing easily in short stanzas. The book itself is divided into five parts that correspond to her college years and a trip abroad. Poetic imagery is used sparingly and more as punctuation to what she is seeing rather than a means to create an image that is not real (meaning she is not a fanciful poet, she is a realistic interpreter of places and events). This concreteness to her style adds weight to her poetry and helps convey the autobiographical nature of this work. Perspective on gender/race/culture/economics/abilities: While this work is written from the perspective of a young, white, Jewish female from an upper middle class family, her condition crosses boundaries on all these levels (race, gender, religion, economic). Where her particular perspective is most powerful is in its relation to our culture and how it views the mentally compromised or disabled. While it primarily provides insights into how she fears she will be perceived, there are enough references to how others actually relate to her to understand the prejudice and misunderstanding our culture has in this regard. The theme of wilderness appears in both the Old and New Testaments. Depending on your perspective, “wilderness” takes on different meanings. In this selection of passages I am attempting to highlight three perspectives on “wilderness” for theological consideration: 1) The view from the outsider – the Egyptians see the Hebrews as lost and wandering; 2) The Hebrews sometimes recognize and at other times have to be reminded that God was with them in the wilderness – God did not abandon them; and 3) Sometimes the wilderness is not an external place, but an internal state of being. What did you think of Samantha’s relationship with her parents? How did they relate to Samantha’s illness? How is their relationship different (or similar) to your relationship with your parents? How do you think people see you? What do you want people to know about you? What happens when they find out you have an anxiety disorder? How do you think God sees you? Do you experience God’s presence? In what way? Do you feel God’s presence differently when you are experiencing (or before/after) an attack? How would you interpret the verse from Psalm 102? Do you sometimes feel that God has abandoned you to some kind of wilderness? If God wants us to love God with all our mind, how do you react to that statement? Do you feel that it is more (or less) difficult for you to love God with your mind given your illness? Why is Samantha’s story important to hear? Can you relate to her illness? Does any part of her poem-story resonate with your life? What does that mean to you to love God with heart, mind and soul? Is that sometimes difficult? What if one part doesn’t “work”? Has God given someone who is physically or mentally impaired an impossible task? How does your faith come into play when you feel alone or abandoned? Where is God in those moments? How do the passages about the wilderness apply to Samantha’s book? How do they apply to your life? Do you think the church would be another sort of wilderness for someone like Samantha? Why/Why not? 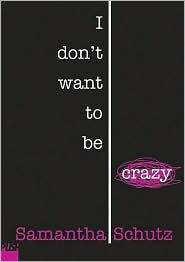 I Don’t Want to Be Crazy by Storypath is licensed under a Creative Commons Attribution-NonCommercial 4.0 International License.